You all know that I sell a lot of the girls things at my co-op sale, on Craig's List, or to my friends. I also give away a lot of stuff on freecycle or to friends. I wash the girls clothes carefully to keep them nice, Mr. Quimby will wipe down the girls shoes with a damp paper towel, and I have a pretty good system for organizing (even though it is now just two different piles in separate corners of my bedroom) what is to save and what is to freecycle, sell now, or sell at the co-op sale. But one thing I can't figure out is what to do with the shoeboxes. Although I buy some shoes for occasional wear at the thrift store or the co-op sale, most of the girls shoes are purchased new and most are Stride Rite. It's a classic brand, they usually have some traditional, little girl styles (which I prefer) and there's an outlet about 30 minutes away that has a good selection. I freecycle the sneakers and the shoes that aren't in "very good used condition" or better, but I've been saving the shoeboxes because I think they look nice to display them with when I go to sell them at the co-op sale, but man, those shoe boxes take up a lot of room. 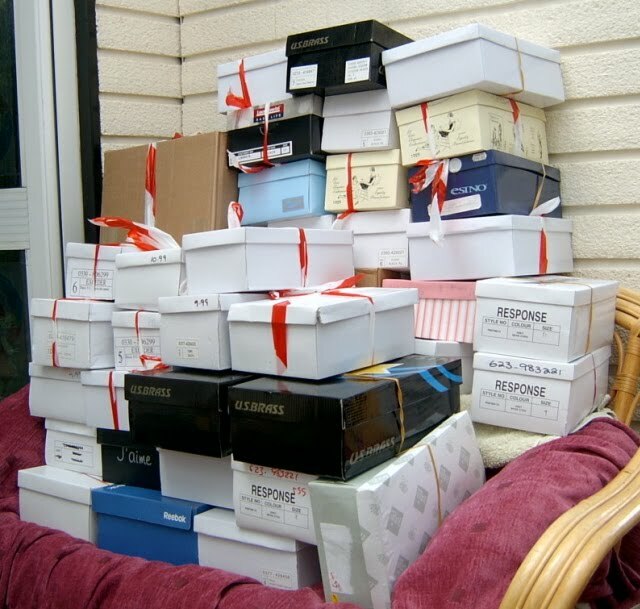 So, my dear thrifty friends, if you are shopping at a consignment sale are you swayed by shoes that still have their original boxes ? If not, please give me permission to discard these shoe boxes ! If you enjoy reading about shoes, you'll love AwwwClutter ! I like boxes that are in good shape, but it probably only adds about $1 to the price I'm willing to pay. Count your boxes and see if the space is worth the maybe $20 you'd be able to get for them. I'm not sure the box would make me buy the shoes or not. I'd say toss the boxes, keep them all in ziplock bags in one big box. Is there space at the co-op sale to display the shoes in boxes even? I like to keep the boxes of some of my special/expensive shoes (but I keep them at work). If I were to buy 2nd hand shoes, I don't think the box would influence my choice. I say toss the boxes. They likely wouldn't impact my purchase decision either. Better yet, I bet you can recycle them somewhere.